amsung are famous for their innovative technology products, coming out on a monthly bases. Smartphones, laptops, tv’s…. and tablets – the segment that combines all in one. We’ll show you the second generation of the recently announced and already bestselling Galaxy Tab. 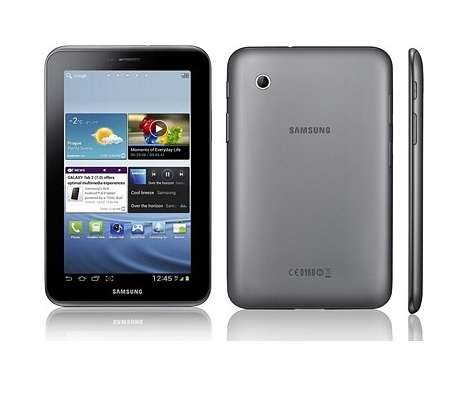 This is the 7-inch Samsung Galaxy Tab 2 P3100. Let’s start with the design. It reminds us a lot of the smartphone S3 with its rounded corners and smooth lines. The main material used is polycarbonate with matte and glossy finish. What’s surprising is that they both don’t attract fingerprints. Unfortunately, we can’t say the same about the display. The tablet is light – just 344 gr, including the battery. Its dimentions are 193.7 mm hight, 122.4 mm width and a thickness of 10.5 mm. So, it’s ok to use it with both or just one hand. 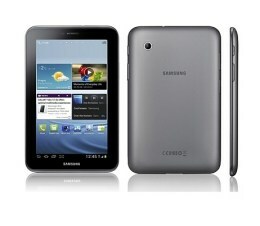 The display of the Samsung Galaxy Tab 2 is a 7-inch PLS LCD capacitive touch screen with a resolution of 600 x 1024 pixels. Here we have 16 million color shades, making the picture vivid and visible in normal lighting and not so in direct sunglight. The touchscreen itself operates well with no lagging. In the upper part we find the camera for video calls and on the rear panel – the main one with a 3.15 MP equivalent and a maximum resolution of 2048 x 1536 pixels. Among its functions there is smile detection and the geo-tagging, combined with the navigation system. The operating system of Samsung Galaxy Tab 2 is the Android v4.0.3 (Ice Cream Sandwich). The processor also has proven its quality – dual-core ARM Cortex-A9 running at 1 GHz each. The graphic card – GPU PowerVR SGX540. The built in storage for user files is 8 GB, but is could be increased to +64 GB via the MicroSD card slot.